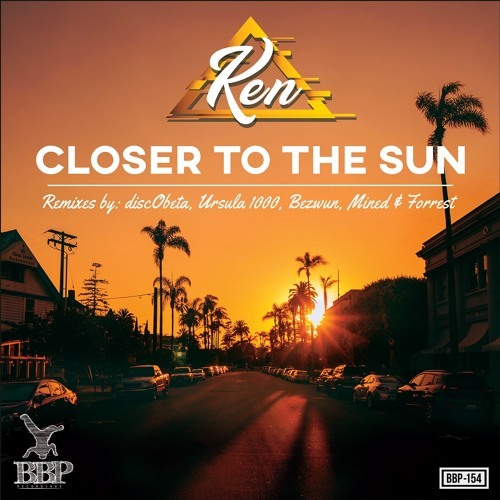 Ken is blasting into the scene with an instant classic funky joint called Closer To The Sun, and is being accompanied by veteran established names on remix duties. US-based Ken has a good ear for chilled funky hooks and has cooked up a perfect example on the title tune on this EP. Good friend and partner producers from discObeta is taking it further down the chilled path with their down tempo trippy mix which will be sure to please your ear. discObeta has featured on multiple compilations and remixes as well as dropped the Chinese Robots EP right here on BBP. Legendary electro disco funk producer from New York Ursula 1000 also adds his signature treatment to the Closer To The Sun jam by adding some catchy electro synth and beats to keep the trippy vibes going strong. German producer-duo Mined & Forrest takes the track to the dancefloor by applying a well-arranged midtempo groove and some ghetto funk beats. The track is spiced up with a good doze of catch vocal samples for the ghetto funkers. Last but not least we invited Australian bass producer Bezwun who cooked up a smooth housy bass mix to keep the party rocking well into the night. Lots of diversity and twists on a classic original joint on this EP to keep things funky as always – right here on Breakbeat Paradise Recordings. More info on Ken and the Remixers: http://www.bbprecordings.com https://soundcloud.com/discobeta https://soundcloud.com/ursula1000 https://soundcloud.com/minedandforrest https://soundcloud.com/bezwun Bio on Ken: KEN ascends from a state: The range of perception, understanding, vision and knowledge. Bringing the debut single "Closer To The Sun" to life with a crunchy break beat, a flurry of sitars and and infectious blues style vocal. Hailing from the North East (U.S.), lifelong friends and collaborators of discObeta, KEN is a seasoned musician and songwriter. There are rumors that KEN also works with well know downtempo artists holding duties as a guitarist, bassist, drummer, and engineer. Not much more is known about this multi-talented artist... and he likes it that way. KEN has had his share of label deals, brushes with famous artists and has a unique relationship with the backbone of one the greatest bands in the world. Where the many desperately seek the limelight, this stoic artist strays away from it and would rather relish in the wash of melody, beats and the exotic. KEN may or may not be the future of music and he likes it that way. This is surely not the last time we will hear from this mysterious music man. Always in the lab cooking up something new to provoke and stimulate your feets and ears. KEN cares about music as a healer and soundtrack to life.